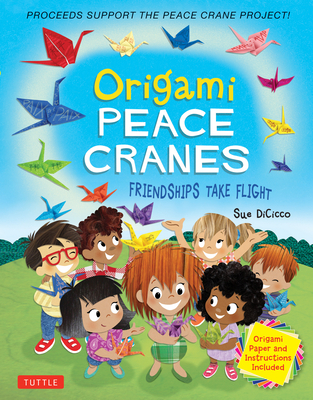 Origami Peace Cranes is a multicultural children's book about the capacity for friendship in all of us, and the power of small, but meaningful actions. Filled with fun pictures and ideas, this story addresses the anxiety that comes with new beginnings and introduces kids to moving, making new friends, and starting at a new school. This book also includes: Step-by-step instructions for making a paper crane12 sheets of origami paper, so that kids can make their own cranes to share Proceeds support the Peace Crane Project--originally created for the United Nations International Day of Peace, it aims to expand students' understanding of and appreciation for other cultures, people and countries. Writer, illustrator, sculptor and former Disney animator, Sue DiCicco, founded Armed with the Arts (ArmedWithTheArts.org), a program dedicated to encouraging creative expression in kids. She is the creator of the Peace Crane Project with participation from over 150 countries. She has written dozens and illustrated hundreds of books for kids.